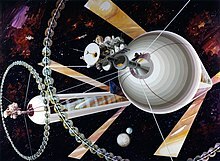 Gerard Kitchen O'Neill (6 February 1927 – 27 April 1992) was a U.S. physicist and advocate of space colonization. Born in Brooklyn, he graduated from Swarthmore College in 1950 and received a doctorate in physics from Cornell University in 1954. In the same year he joined the faculty of Princeton University, with which he remained associated until his death. O'Neill's early research focused on high-energy particle physics; he notably invented the particle storage ring. There's no point in going out into space if the future that we'll see there is a sterile future living in tin cans. We have to able to recreate in space habitats which are as beautiful as earth-like as the loveliest parts of planet Earth and we can do that.